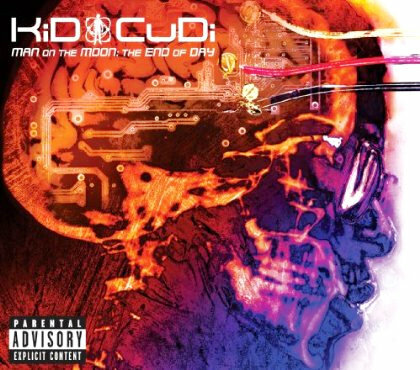 If you don’t know Kid Cudi, get familiar. The arguable king of the new generation of hipster rap is going to drop Man On The Moon: The End Of Day on Sept. 15th and that means cool grooves and headnods for all. As well as collaborations with MGMT and Ratatat. So baste your brain with a little bit of visual gravy and check out the album cover and track list for his new disc. Just ran across this new stuff from Matisyahu. His new album, out yesterday, had caught me by surprise... not because I was looking for it and missed it, but because I've ran across multiple (and strategic) mentions about it. It started off with a co-worker telling about this piece on NPR this morning. Then I ran across a full stream of his new album, then ending up seeing his video, which I posted below. All good stuff. The Rural Alberta Advantage Tomorrow! I'm more excited about this show than I've been in quite some time... Should be a great show, in the Beachland's Tavern, and for only $7!! The Rural Alberta Advantage play indie-rock folk songs about hometowns and heartbreak, born out of images from growing up in Central and Northern Alberta. They sing about summers in the Rockies and winters on the farm, ice breakups in the spring time and the oil boom’s charm, the mine workers on compressed, the equally depressed, the city’s slow growth and the country’s wild rose, but mostly the songs just try to embrace the advantage of growing up in Alberta. Check out Unsparing Sea here. Check out Alan Madej here. I know this isn't hot news anymore, but I think it's a great idea... I'm looking forward to some focus being put back on the album. The next rumored date for an Apple event is Sept. 7th. Keep an eye out. There is very little to get excited about when it comes to new media file formats, for the average person. Sure, they offer better compression, better quality, smaller file sizes, etc., but they also cause headaches, render hardware obsolete, and just generally inconvenience everyday computer users. Apple is reportedly working on its own new format, but it looks like it could bring something to the table which will give everyone something to get excited about. The new format, which is code named “Cocktail,” according to various whispers and rumbling around the web, will be more than just a new single-media codec. Instead, it will supposedly package a multitude of different components into one convenient package, which is why it presumably earned the Cocktail nickname. Just like a mixed drink, it’ll deliver the main ingredient (music) with a selection of experience-enhancing extras, including lyrics, sounds, movies, and more. The new format is designed to draw in more digital music customers by providing extras you wouldn’t get via piracy, and to attract mainstream consumers who prefer traditional physical media because of box art, liner notes, and other perks that don’t always come with digital downloads. Filling the void from where Clap Your Hands Say Yeah has left off... This Flashy Python album is good stuff, but then I'm kind of a sucker for Alec Ounsworth voice. Looks like this is only available via the Flashy Python website. He offers even offers FLAC & Vinyl options - respectable. We already told you about Mo Beauty, the solo album that Alec Ounsworth, frontman of the on-hiatus Clap Your Hands Say Yeah, will release on Anti- on October 20. But when Pitchfork spoke with Ounsworth a couple of weeks ago, he told us that he'd also recorded another non-Clap Your Hands album, this one under the moniker Flashy Python. According to Ounsworth, the Flashy Python album is "more about me trying to erect some grand statement" compared to the album he recorded under his own name. Wow... Good song, GREAT video. Sorry I'm going to have to miss this yet again... But you shouldn't! WRUW is proud to announce that the legendary MISSION OF BURMA will be headlining WRUW's 28th annual Studio-A-Rama!!! Now in its 28th year, Studio-A-Rama is WRUW's annual FREE, outdoor, day-long rock concert. This year's headliners is Boston 's post-punk pioneers Mission Of Burma!!! Mission Of Burma have been releasing music since 1979, including 1983's legendary "Vs.". After an almost 20 year hiatus, Mission Of Burma returned to issue 2002's "OnoffON" and 2006's "The Obliterati". Their newest release "The Sound, The Speed, The Light" is set to be released in October, so expect Mission Of Burma to play some new songs from that release as well as songs from their classic catalog. 10:00PM to Midnight - MISSION OF BURMA !!! The entire show shall be simulcast over 15,000 watts ( Ohio 's most powerful college radio station) on 91.1 FM, and also webcast around the world on www.wruw.org. Studio-A-Rama also demonstrates WRUW's commitment to local and regional music, giving 7 bands the opportunity to play before hundreds of people, opening for a national headliner. Again, all bands will be heard over the radio at 91.1FM and over the internet at www.wruw.org. Since 1982, WRUW has staged this free annual concert designed to thank listeners for their ongoing support throughout the year, and especially during WRUW's annual telethon. An enthusiastic audience response during the annual on-air fundraiser enables WRUW to continue hosting Studio-A-Rama as well as fund live webcasting and support local music and live music. Studio-A-Rama is one part of WRUW-FM's commitment to broadcasting local bands live. The "Live From Cleveland" show broadcasts bands from the WRUW-FM studios every Thursday evening from 10 until 11pm, and WRUW also simulcasts the live music from the main stage of the annual Hessler St. Fair. It's Sunday morning, sunny, and I have not a thing that needs to be done... (well, nothing urgent). Sitting here and going through my music news and discovered a pretty great Swedish pop song. A fun way to start the day. The band is The Sound of Arrows and they have a kind of early Erasure sound, which is a big compliment in my book. The video is a little ridiculous, but worth it. Following the amazing Chairlift show earlier in the evening, I headed over to the Grog Shop to catch Joe Pug and The Low Anthem. This show had two openers, even before the Low Anthem, which worked out perfectly for me to get there in time to see them take the stage. I didn't have much experience with them before the show, but after hearing Cleveland Bachelor RAVE about them, I knew I couldn't miss it. 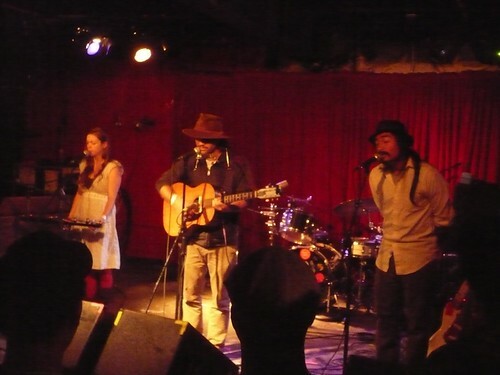 I was a little surprised to see a more mild, spacious performance at the Grog Shop, but I guess that's about what you expect for a band opening for Joe Pug. They were great, kind of felt like they just rolled off a dusty caravan touring through the dusty southwest. If you want to read a more capacious review, check out CB's review. Luckily I found someone who posted a whole slew of videos. 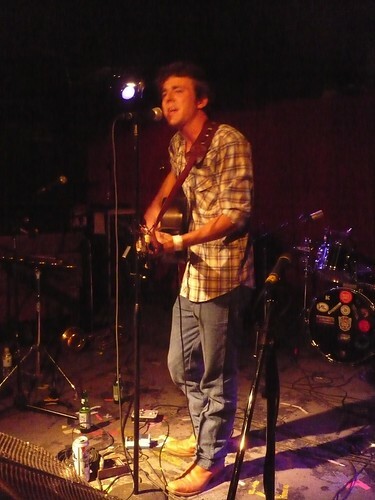 Joe Pug was the real draw for me. He kind of gives me the early Dan Bern vibe... something about a passionate guy with a guitar gets to me. 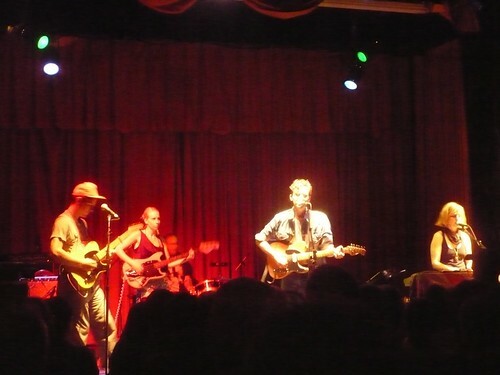 Seeing him open for Josh Ritter at the Beachland was fun, but this was sooo much better... more intimate. I look forward to hearing much more from him. Tom Evanchuck recently sent out a message about his MySpace page revamp. Looks good! I was happy to see a video posted there too. He'll also be at Dewey's Coffee Cafe in Shaker Square on Friday, August 28th! Check him out... You won't be disappointed. Get Ready… The Sufjanites are about to go crazy! I think I’m going to stay away from this show… Not a huge fan, though it's probably just because I haven’t invested the time. Not liking sold out shows at the Ballroom won’t sway me any closer. TICKETS ARE LIMITED TO 2 PER PERSON! TICKETS GO ON SALE THIS SATURDAY, AUGUST 15 AT 10am! MUSIC SAVES WILL OPEN EARLY THIS SATURDAY MORNING, AT 10am INSTEAD OF NOON! BRING YOUR FRIENDS! BRING CASH FOR YOUR TICKETS! NO SERVICE CHARGE! DISCOUNT ONLY GOOD FROM 10am to NOON! 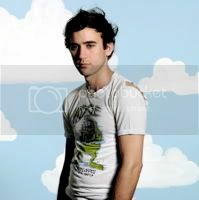 Recent announcements about Sufjan Stevens releasing a “re-imagined” version of his 2001 instrumental album Enjoy Your Rabbit and a tricked-out multimedia set documenting his 2007 “BQE” piece were all well and good, but it also seemed like dude was stalling a little. But no more. Sufjan is set to tour very intimate venues on the eastern half of North America starting September 21 in Philadelphia and wrapping up with four dates in New York City. His label, Asthmathic Kitty, makes it clear that the tour “has nothing to do with” the “BQE” box— so it seems safe to expect some of those Sufjan songs you still put on repeat every now and then. And, who knows, maybe he’ll break out a couple new ones, too? 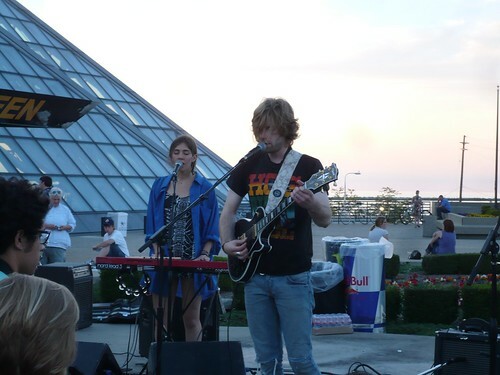 Finally was able to make it to one of the free Rock Hall Summer shows! Man, I wish it hadn't taken me so long... This show was great. 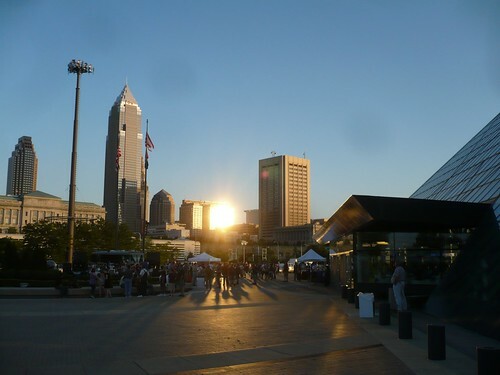 Equalling the excellent performance by Chairlift was the sunset and Cleveland Skyline. I took plenty of photos that you can see here. This by far was one of the coolest things happening in Cleveland, and I was disappointed to see how few people were there. Part of me wanted to say "Shame on you Cleveland" for not having a better turnout. But the yogi in me, saying "things should just be the way they are" made me realize that I'm happy that I could be experience such a cool thing without fighting people and traffic. Not that I don't like the Walkmen, but I already (sorta) heard them at Pitchfork, and it was a weeknight it wasn't going to be a late night. He was wearing the same jacket as in his video and seemed quite shy, as I kinda expected. Often he played to his band and little to say. But still, his music says enough. Good stuff. You may remember me talking about Chris O'Brien's show at the Barking Spider. Wonderful. Well, he's working on a new album and is looking for some help. He's a great guy, and a great musician and he deserves it. Click below to help. He'll also be back in town and performing at the Winchester on Monday, September 28th. Holy Crap! NPR Offers Downloads from Newport Folk Festival! NPR continues to amaze me. I saw they posted a bunch of entries about artists at the Newport Folk Festival, but I didn't realize they were offering MP3 downloads of each performance. Brilliant.